One other change of command that took place with the inauguration should be noted. 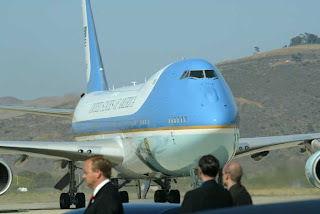 Col. Mark Tillman, USAF, flew his last mission of the VC-25 known as Air Force One. His last mission, from Andrews Air Force Base to Midland, Texas and back was not flown with the callsign Air Force One, however. This flight was known as Special Air Mission 28000 (SAM28000). Col. Tillman, a veteran of 30 years is retiring from the Air Force and passed his command to Col. Scott Turner. Col. Tillman was in command of Air Force One on 9/11 and also flew President Bush to Iraq on Thanksgiving 2003. The Thanksgiving mission was so secret, according to Col. Tillman, that the crew was not told until just prior to take-off and the crews in Baghdad did not know the President was arriving until he landed.